When art therapist Kate Harding meets with a young patient in grief, she's startled, but not surprised, to find that the little girl recognizes the person in a painting on her wall. It takes Kate back to the year her mother died, and the meeting with "Mr. Josh" that inspired the unforgettable portrait. 304 pages, softcover from Realms. When a young patient grieving the death of her sister recognizes the man in a portrait hanging in her office, Dr. Kate Harding, an art therapist, is startled but not entirely surprised. The face in the painting takes her back twenty years to snow-covered Cedar Point, Kentucky, and to her first Christmas without her mother. As Christmas approached, John Harding, his daughter, Kate, and son, Chesler, were struggling to adjust to lifes changes after the September death of his wife and their mother. When a conversation with Granny Grace convinced Kate that there was Christmas in heaven, she was determined to get her mother a present, a special gift that would make her mother happy forever. No one could tell Kate how to get her gift to heavennot her daddy, not Uncle Luke the medical student, not Aunt Susannah Hope, and not even Pastor Simmons who she was most certain would have the answer. But Kate devises and executes a Christmas Eve plan that changes her life. Kates Christmas is filled with surprisestaking in a runaway girl who had no mother, a tender exchange of Christmas presents, a meeting with Mister Josh, and finally, an astonishing family Christmas portrait. Phyllis Clark Nichols has a degree in English and a masters degree in music from Southwestern Baptist Theological Seminary. She and her husband cofounded a national cable network featuring health and disability-related programming. For over a decade she has worked in the orphanages of Guatemala and currently serves on several nonprofit boards. Phyllis and her husband make their home in the Texas Hill Country near their two daughters and their families. 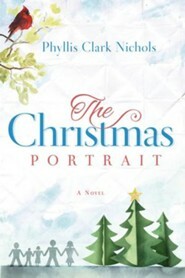 Visit www.phyllisclarknichols.com for more information. I'm the author/artist and I want to review The Christmas Portrait.